Time for some backstory for characters I recently decided to include . Zuri didn't have very high thoughts about Kion when they where younger, but her feelings towards him started to change as they grew up. Sure, he wasn't going to be the future king. But still, being the mate of The lion guard's leader wasn't too bad either. On top of that, he was growing into quite a handsome lion... . So she starts to associate with him more and he don't seem to mind the attention. After a while, Zuri feels confident enough and confesses her feelings for him. But to her surprise, he rejects her. Saying that he is flattered that she likes him so much, but that he already loves someone else. Zuri, shocked and heartbroken wonders who this lioness may be. What Zuri didn't know was that her best friend, Tiifu, also had feelings for Kion, but for different reasons. To her, he was one of the most selfless and noble lions she knew and admired him for his hard work to keep the pride lands safe. But when she found out Zuri liked him too, she decided to keep her feelings for him to herself. 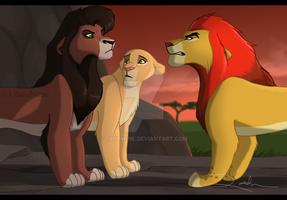 Besides why would Kion want her when he had a pretty lioness like Zuri at hand? Which is why she is surprised when Zuri comes to her seeking comfort after being rejected by him. But the biggest shock comes to Tiifu when Kion comes up to her a few days later and confess his love for her. Tiifu knows what would be the more noble thing of her to do, but she just can't bring herself to turn him down. Kion is overjoyed that she feels the same for him, but they agree to keep their relationship a secret for the time being to give Zuri some time to get over her broken heart. Little did they know that Zuri had followed them, wanting to talk to Tiifu and ended up seeing the whole conversation. I'm not too sure about the way I wrote this story, but I hope it makes sense x). Either way, this takes place after the events of TLK 2 so the relationship between the character aren't quite the same as in TLG. I'm not sure about the perspective in this one :/ Zuri looks a little too close to go unoticed by them. But the rocks are suposed to hide her . Making this also gave me an opportunity to try a new medium for the continuation of the story. I was working on the last page for MotP yesterday as well. But it's very detailed and I can't reuse or slightly edit previous background like I have through most of the epilogue pages. I seriously love this story! 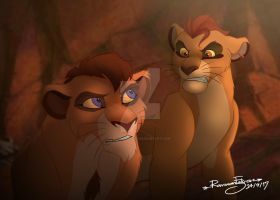 Awww Kion look his father Simba! Awww! I'm so glad Kion liked Tiifu too! I was getting ready to be sad, hahaha. But wuh oh! I hope Zuri and Tiifu will still be able to get along after this! Yikes! Heheh, well it's a sad situation for Zuri . Very fitting song for this part indeed. Interesting story! Would you like to talk about who we think Kion's mate could be in the future? No thanks, I don't think it's much of a point with that since we'll probably never see Kion grow old enough for a mate in the show anyway. oh, you make stories this way? Not bad idea and interesting. I like to read this and part two too. Do you keep going with that? Yes, part 2 is already uploaded. This story will continue like this at least. OH MAN the drama. Omg. and when she grows up, she will be a lot prettier than she was before. 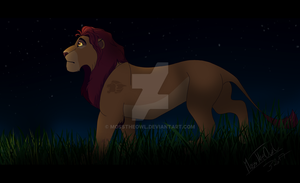 Would still fit to your "Besides why would Kion want her when he had a pretty lioness like Zuri at hand?". She only thinks Zuris appearance is still prettier, because a long time is was this way. I feel really excited about this story, since I love to pairing Kion with Tiifu myself. I love your style too. In my world, Tiifu will become Kion's mate and head huntress and they have two cubs. And Zuri have mate from some handsome rogue, but he turns out to be quite jerk. I see. 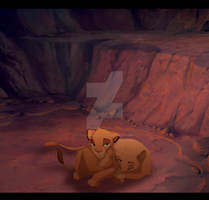 Tiifu and Kion only have one cub in my story. Lol, that's actually not too far of from what I have in mind for Zuri . Ouch! Poor Zuri. Even though she didn't love Kion like Tiifu did. But still, that must have hurt. Yeah Tiifu isn't proud of it. But there was no way around it really, someone would have been hurt either way. Well thought of! And well written too! I don't see it as Betrayal if Zuri was giving her attention to Kion thinking 'well the mate of the lion Guard is better than nothing' Seems like Zuri saw him as his status first, and a friend second. So honestly, doesn't seem like she should hate Tiifu (Not saying she does but just in case), when is seems Tiifu had more honest feelings for him. Well, true. Zuri don't love Kion the same way Tiifu do. I imagine what sparked her interest for him in the first place would have been the thought of status and his looks. But that she would (in her own way) come to care for him as they spend time together. Which is why she felt hurt when she got rejected and now sees this. Oh! The betrayal must sting. Indeed . It's a hard situation for all of them. I feel kinda bad for them though. Yeah I guess I can understand if you feel bad for Zuri to an extent given her feelings we're kinda dashed and Tiifu feeling kinda stuck in the middle of it all with her own feelings and not wanting to hurt Zuri. In the end though when you think about it someone is gonna get hurt. Yup either one is hurt or they all are.